They say Orion always comes up sideways, and he does seem to on this cold December night. 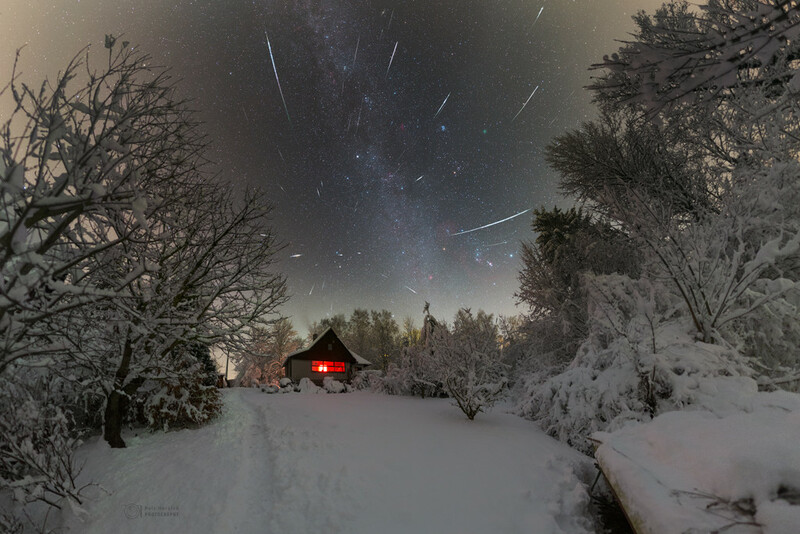 The bright stars of the familiar northern winter constellation lie just above the snowy tree tops surrounding a cozy cottage near the town of Ustupky in the Czech Republic. But Gemini’s meteors also seem to rain on the wintry landscape. The meteor streaks are captured in exposures made near last Friday’s peak of the annual Geminid meteor shower. They stream away from the shower’s radiant above the trees, near the two bright stars of the zodiacal constellation of the Twins. Comet Wirtanen, a visitor to planet Earth’s skies, is visible too. Look for its telltale greenish coma near the stars of the seven sisters. Posted on Saturday, 22 December 2018 by VGC	This entry was posted in ifttt-photograph and tagged IFTTT, NASA. Bookmark the permalink.